Share code untuk tools pembersih “log” dengan menggunakan phython, manfaatnya adalah anda bisa menghilangkan jejak sejenak dari log yang tersimpan. 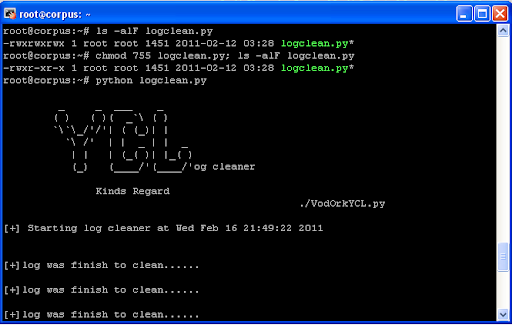 #logfile and also can watch a logfile for modifications. print "\n Usage: python logcleaner.py <option>\n"
print "\t -i <ip>: Ip to search for and replace"
print "\t -e <file>: Encrypts logfile"
print "\t -d <file>: Decrypts logfile"
print "\t -w/-watch <file> <time to check> : Watches logfile for modification"
print "\t -h/-help: Prints this menu\n"
print "[-] No Active Logs Found"
#Lets not search a file with no data. #print "\t[-] IP not found"
print "[+] Finding More Logfiles..."
print "\n[-] Need a time in seconds (ex: 60)\n"
print "Error: Check your full path.\n"
print "\n[-] Cannot Open File, Check Full Path!! !\n"
print "[+]log was finish to clean......\n"
makasih om admin.. nice info..
maaf ini buat LINUX ya? ataw bisa buat windows jg? Kayaknya lebih gampang pake CCleaner ya gk.? buat windows bisa ga nih gan ?